Hi there! It's the 15th which means it's time for another Gossamer Blue Blog Hop. If you're following along, you probably just came from Nicole Harper's page. Welcome here! 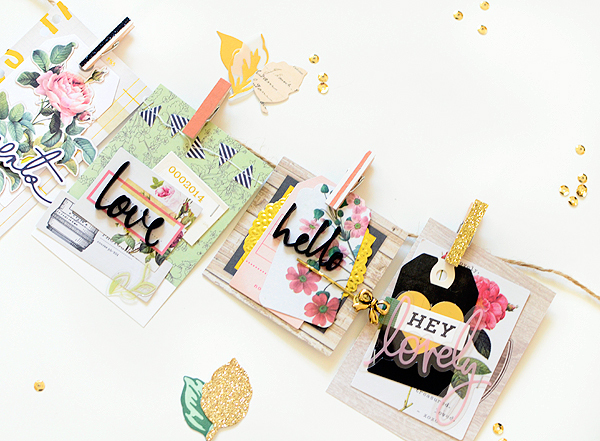 (And if you're not following along, you will probably want to...The GB Design Team is sharing some of their really awesome projects, all made with the November kits.) I've got some lovely floral tags--because I'm convinced that you can never have too many tags. 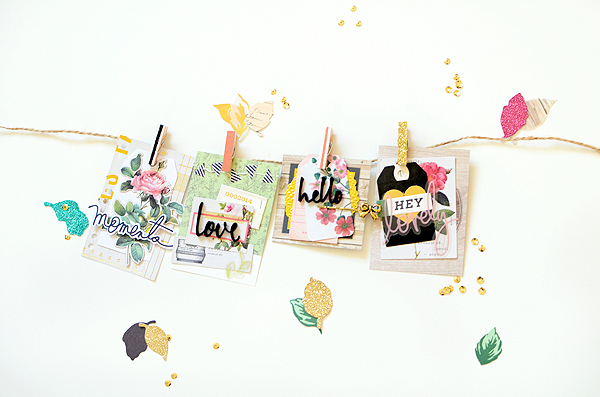 GB's November kits offered some gorgeous items from Maggie Holmes, Heidi Swapp, Basic Grey, and of course, the amazing in-house GB designers! 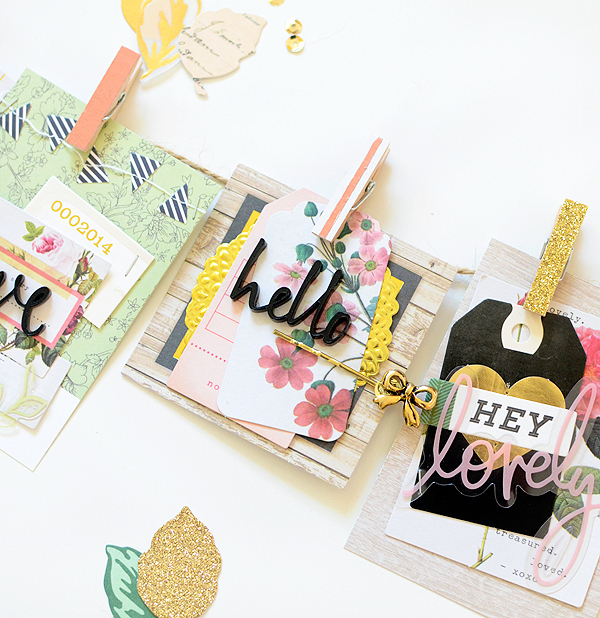 I certainly did a lot of mixing and matching of both brands and kits to create my tags. The acrylic words from the Life Pages Add-on #3 were some of my most favorite items. I wanted to use them on everything I made this month, but in the end, settled on the tags. I like how the bold black gives a bit of an edge to the otherwise overflowing-with-feminity pieces. Because, while I wanted them to be very floral and pretty, sometimes it gets to be a tad too much. This Heidi Swapp tiny triangle garland from the Bits & Pieces kit was actually an afterthought, but after I added it, I was so glad that I did. Again, it lends a modern touch to the shabby chic roses. I think both Peppermint and Traci (GB graphic designers) did so well designing the journaling cards this month, too. 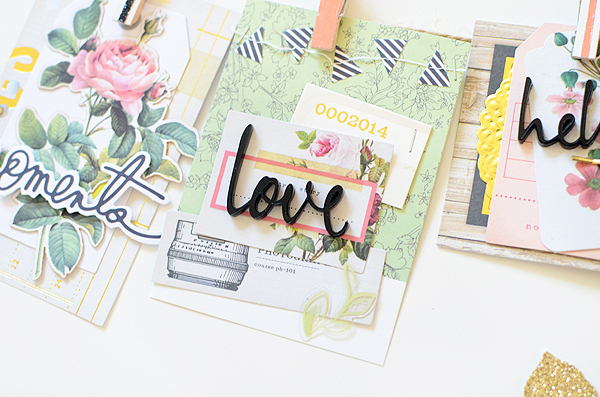 I've never done a Life Pages-type of layout but I find so many other uses for the cards that they've become one of my must-have craft supplies. 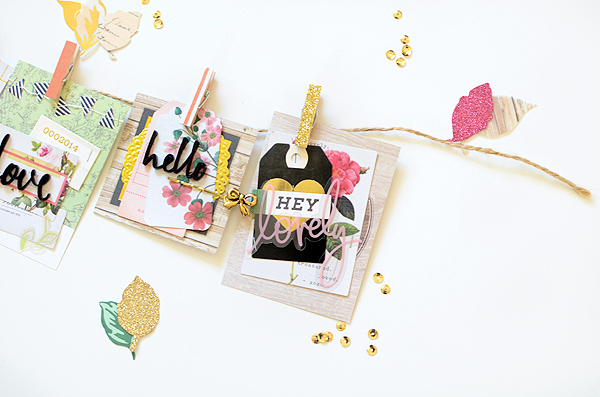 They are the perfect size to use as the base for these tags, for example, and the two cards I chose for this project--Peppermint's green with black florals on the love tag, and Traci's wood grain for the hey lovely one--feel like they were tailor-made for this set. The flowery pieces from the ephemera pack in Maggie Holmes' Open Book, which you've been seeing a lot of here this week, were the basis for my tags. 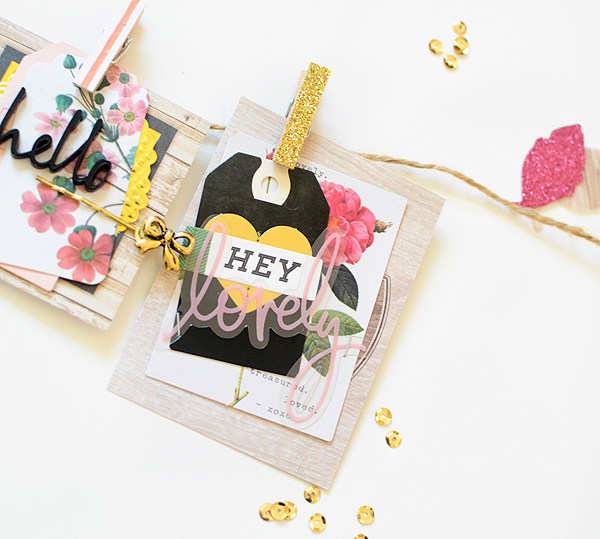 I was attracted to the pinks and greens of the die cuts and when I started layering them together with the gold and black, I loved what I was seeing. 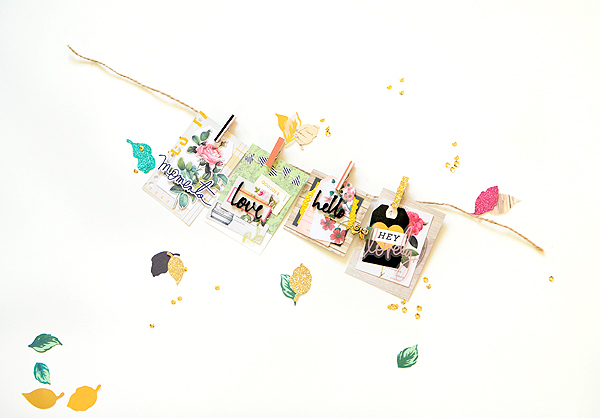 The ephemera pack comes in the Life Pages Themed Add-On. Heidi Swapp's signature words (out of the Life Pages Main Add-on) pretty much work anywhere, don't you agree? The most difficult thing about using the November kits was putting them away to work on other things! Thanks for hopping by! Next up is Sabrina Alery. I've got the entire list of designers with links here but if you get lost, you can always head back to the GB blog for all the blog hop information. Have fun! Just beautiful, Rebecca! I not only adore your work, but your photos are so inspiring too. I love how you stage them. I absolutely love this and pinned it for inspiration! I love this style and I love it! 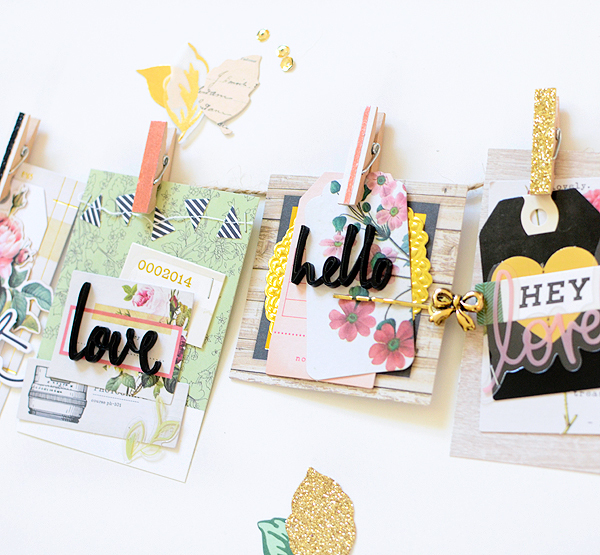 great tags... really love how you layered them and so classy! 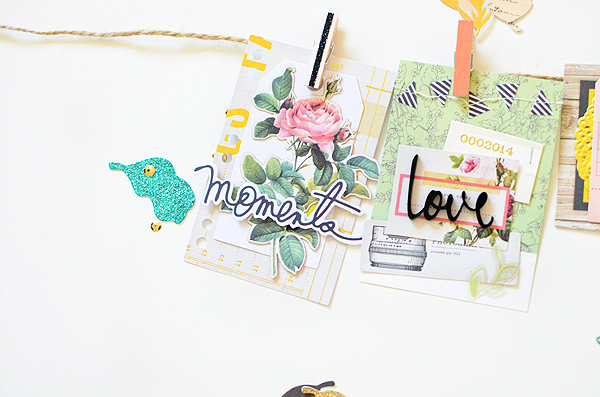 Beautiful tag project, so many sweet details to love!